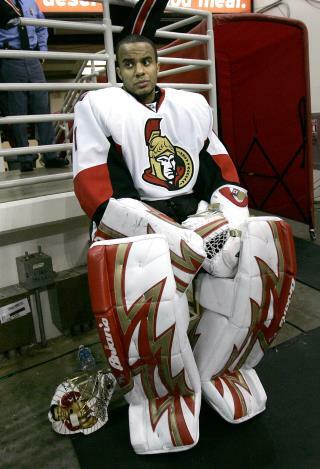 (Newser) – Retired NHL goaltender Ray Emery, who helped the Ottawa Senators reach the final in 2007 and won the Stanley Cup with the Chicago Blackhawks in 2013, drowned in his hometown of Hamilton, Ontario, on Sunday, the AP reports. He was 35. Hamilton Police say Emery was identified as the victim of a swimming accident in the harbor Sunday morning. Staff sergeant Paul Evans says police received a call just after 6am that an adult swimmer did not surface and that the Niagara Police assisted in the recovery effort. Emery's body was recovered just before 3pm Sunday. Hamilton Police, who describe the death as a "case of misadventure," say a cause of death will be confirmed after a post-mortem. Nicknamed "Razor" for his aggressive style, Emery played parts of 11 seasons with the Ottawa Senators, Philadelphia Flyers, Chicago Blackhawks, and Anaheim Ducks from 2003-2015. "Ray was an outstanding teammate and an extremely gifted goaltender," Flyers president Paul Holmgren says. "Ray's talent, work ethic, and determination helped him enjoy a successful 11-year NHL career." Emery played in a charity hockey game Saturday night in Hamilton. After word of his death spread, condolences poured out from the hockey community. "I will always remember Ray as a good person first & foremost," friend and former teammate Dan Carcillo wrote on Twitter. Respects to Ray and his family. That Chicago Blackhawks combination of Corey Crawford and Ray Emery in 2012-2013 was the best ever. Always remember that great season of hockey.